Preface: The 80s were probably the last decade of innocence, characterized by colorful and cheeky fashion, so much great music, the rise and fall of cassettes, the Walkman, BMX bikes, skateboards, boomboxes, Aerobic, Breakdance, Rubik’s Cube, the Chernobyl nuclear meltdown, Masters of the Universe, a period of conservatism in political and cultural life caused by Margaret Thatcher in the UK and Ronald Reagan in the USA, video recorders and of course the constant threat of an imminent nuclear assault. Thanks to @GaivotaStefano for adding the last one to the list of wonderful 80s memories. Let’s don’t forget we consider the 80s as the beginning of the computer age, with visionaries from all over the world spawning a whole new industry. No doubt the UK had the biggest impact on the scene with so many young and talented pioneers crafting hardware and software like no one ever did before. 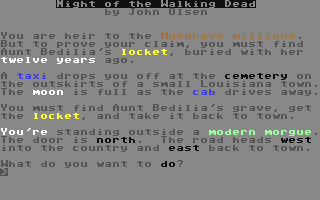 With the coming of adventures, or interactive fiction as many would call it today, games reached a remarkable depth for the first time. Some adventures were text-only, some were supplemented by graphics and they all had one thing in common: people loved them. They still do. 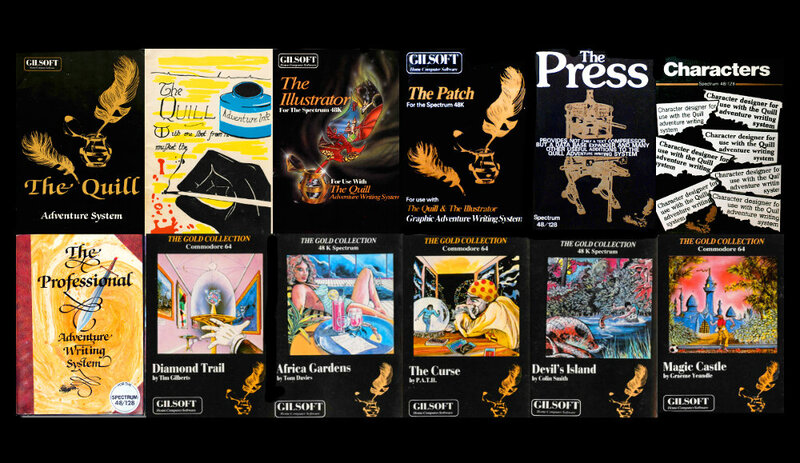 Today we know nearly a tenth of the games ever released for the Sinclair ZX Spectrum were adventures, many being made with “The Quill”, a unprecedented tool still considered as de facto standard for creating text adventures. “The Quill “was released for the ZX Spectrum in 1983 and it became a major success. 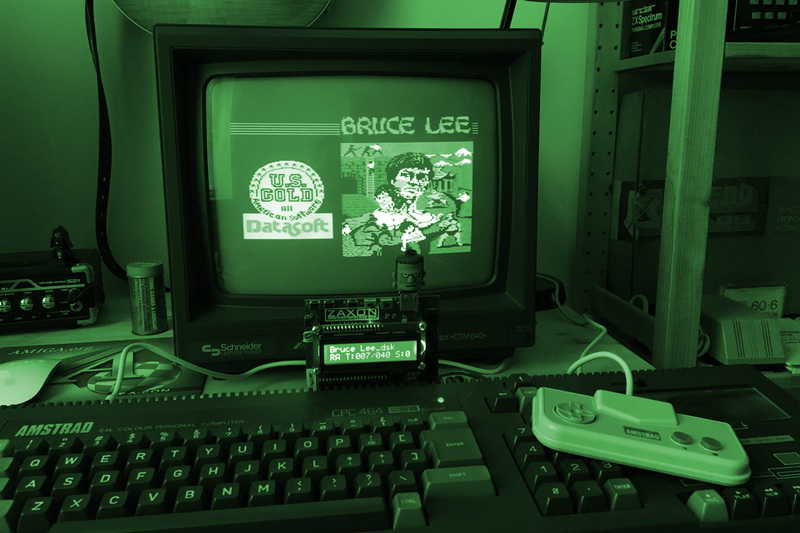 Versions for other platforms followed quickly afterwards, including Commodore 64, Amstrad CPC, BBC Micro, Acorn Electron, Oric, the Atari 8-bit family and the Apple II. 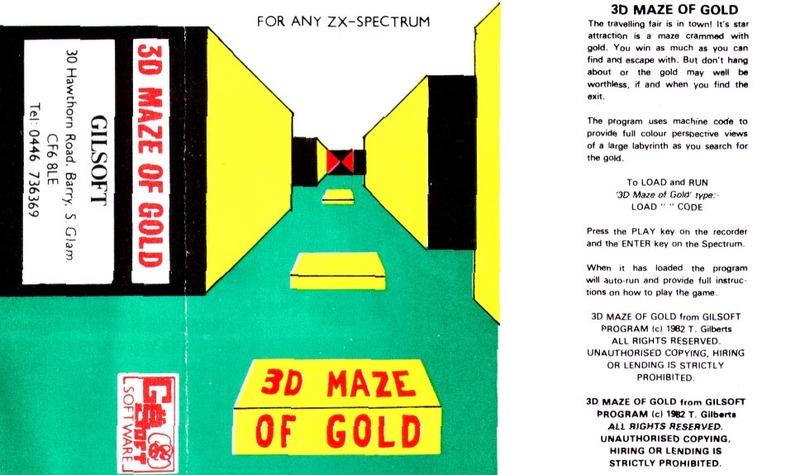 It enabled literally anyone with a home computer to create machine code adventure games. Programming knowledge was notably not necessary, as “The Quill” is an early example of what we understand as a rapid development environment these days. It produces programs on a par with handwritten adventures. That’s probably the reason why over 450 commercially published best-sellers alone were created with “The Quill”. 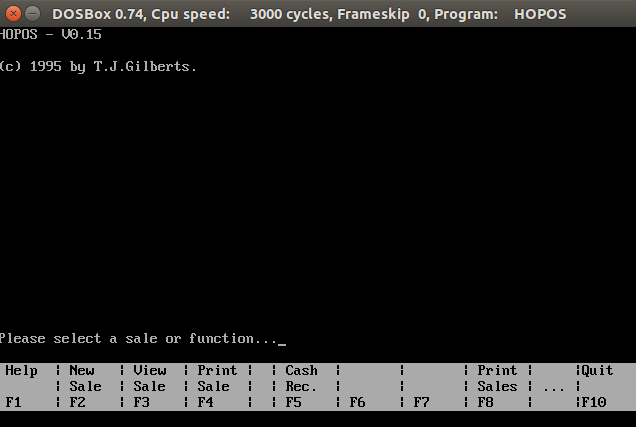 The company behind this legendary tool that undoubtably wrote computer history is Gilsoft, named after the founder Tim Gilberts. It’s no secret that I’m a big Gilsoft fan, probably because of the impact they had with their tools. I’m collecting pretty much everything I can find and believe me: this stuff is so rare and expensive these days. It took me months to get a boxed Commodore 64 version of “The Quill” and I had to import a working tape from Australia to complete the box. Insane! Thanks to a wonderful invention called internet I was able to trace Tim Gilberts and he was more than happy to answer some questions. Is there a better way to learn about history? Tim Gilberts is computer history and he will share his memories with us, giving us a very intimate insight in how it was being an innovator back in the early days of home computing. STEFAN: First of all, let me thank you so much. Up to the present day, Quill/Illustrator and PAW are considered the best tools for developing text adventures on 8-bit computers and there is still quite an impressive fanbase. When I decided to write my own text adventure in 2016, I tested a lot of software for this purpose. I even created my own text adventure engine in portable C. At this point I can say: Quill/Illustrator for any platform and PAW on the Speccy are unbeatable. Even tools that were marketed as better, e.g. Incentive’s GAC (Graphic Adventure Creator) are not. I tried GAC and you can’t simply insert a word in already written text. The Gilsoft tools were so advanced compared to the competitors. Ready for the questions? TIM: Not a problem pleased to help and appreciate your praise for our products. I already had a lot of this material gathered to create a webpage and perhaps book on the subject if people were interested, some are direct quotes from my Dad’s recorded information – I put up a website 16 years ago but didn’t get any e-mails so assumed nobody was interested… That page is still there, so now I think I will update it to at least link to what I have gathered over the years and your interview etc once published if that is OK.
STEFAN: How did the founding of Gilsoft happen? What were your motivations? TIM: I think this can simply be attributed to the ‘buzz’ that was around at the time for software production and the influence of my father Howard Gilberts. 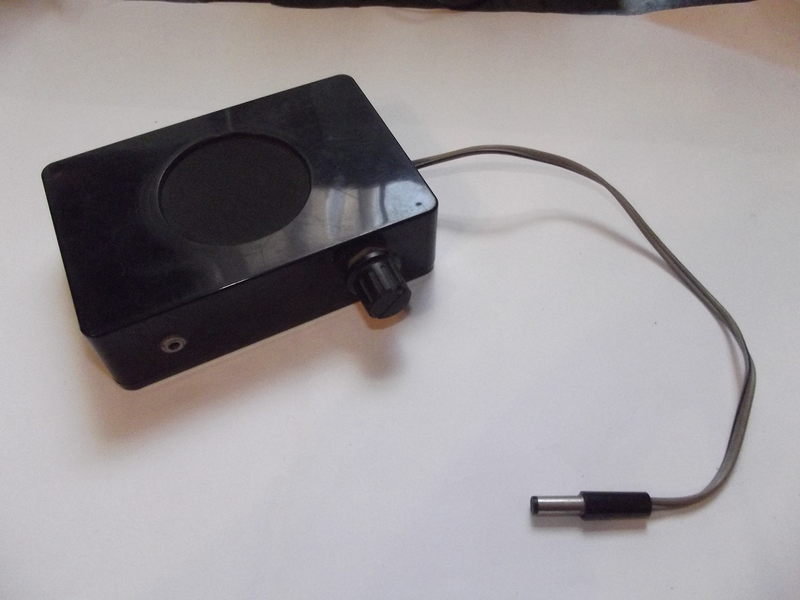 As a telephone engineer he had always instilled an interest in electronics in me – he built a TV Tennis game, from scratch, as a birthday present for me for example. He also in his life always had a ‘sideline’; when he was in school he had produced cats-whisker radios in recycled tins to sell to classmates, in the army he did washing in his photography lab and when his closest friend Don took a job at a cinema they ‘borrowed’ some frames which when combined with my Grandfather’s excellent photography equipment allowed good quality prints of famous actors to be produced, for sale… perhaps not quite as respectful of copyright as we all were later in life but, more on that later. Prior to me building the ZX81, that changed my life, from a kit, I provided labour to assemble his Chromachime musical doorbells from kits bought in bulk for resale… We even had a few PCB layouts with ‘Gilbertronics’ etched on them for new electronicsprojects. 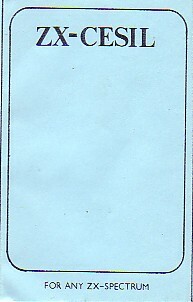 At the time, including in school, computers were very rare, most teaching involved code written in CESIL (Computer Education in Schools Instruction Language) on cards which had to be sent to the County Council mainframe, batch processed and a week or so later you got back your printout – usually with ‘run error’. Two of our maths teachers Mr Danks and Mr Arnold were anxious to learn and teach computing so ran an after school club which gave access to the RML 380Z CPM computer as well as the Terminal to the mainframe. I am sure they were only two pages ahead of us in the books. 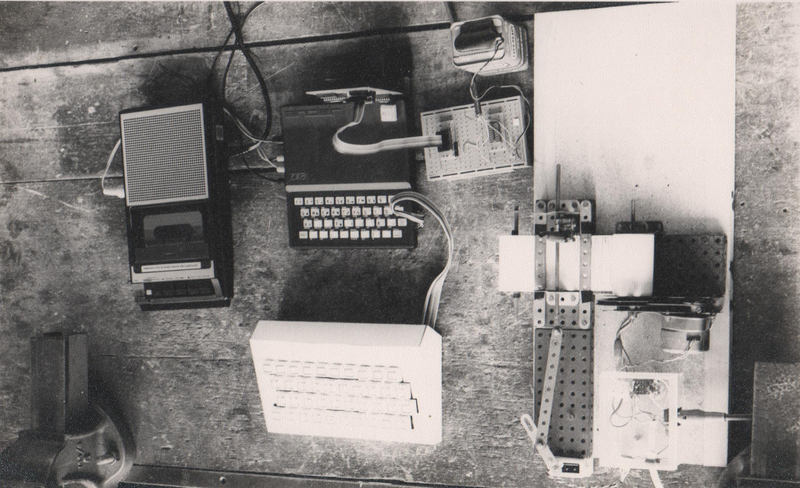 Tim used the ZX81 for a lot of projects. Mr Danks wanted to simplify the sending off of CESIL programs for other students, still a way behind us in study, so he lent me his TRS-80 system for a few weeks to write an interpreter for it so that children could run the programs in class. This was probably my first commission for software – unpaid of course. 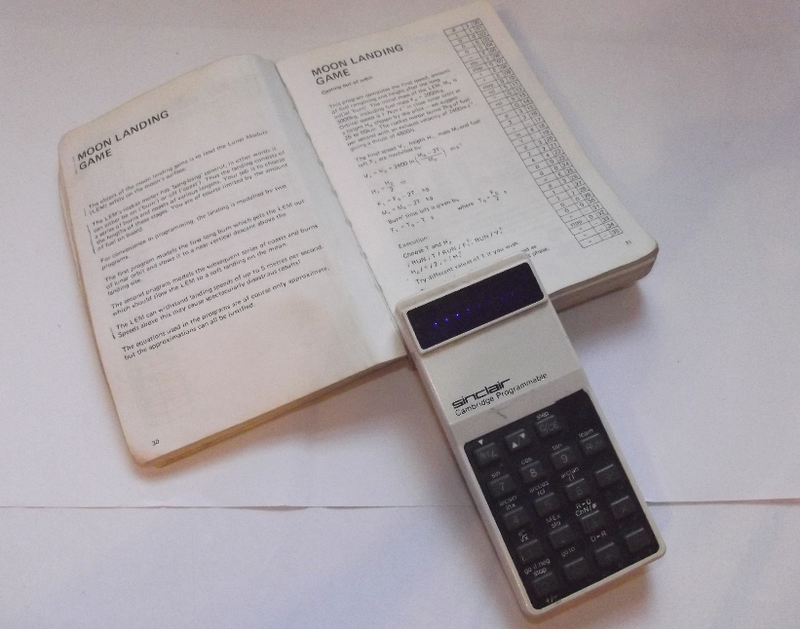 The ZX81 was rapidly joined by an IO Interface and a 16K Rampack so it allowed me to do a lot of project work without solder fumes (which exacerbated my asthma) and eventually gained me a major prize in school for my Design Technology project to create a chart recorder from Meccano and the ZX81! STEFAN: I’ve been told you were very young when you founded Gilsoft and you operated from home initially. Is this true? TIM: As you can see from my answer to the previous question the company seemed to be a natural evolution of the way we were as a family and was based in my front bedroom at 30 Hawthorn Road – on a home built (from chipboard by my Dad of course) desk that had two spaces for computers covered in lovely brown wood effect sticky back plastic. We could not use the attic as that was setup as the electronics workshop producing bells and the photography darkroom, the garage was the store for large amounts of projects and a permanent large Scalextric set. The phone number on the back of the products 0446 736369 was the home phone – the exchange was expanded at some point so it became 01446 – we later get a phone line 732765 for the office space we rented which was then transferred to 2 Park Crescent when we bought it. If you ring that later number now (01446 732765) you will get http://www.homebrewcentre.com and maybe speak to my Mum (Pam Gilberts) as this was the business they turned to when the software wound down and ran for the last 25 years – you may recognise the address on the website as well. STEFAN: Nobody really had experience with home computers back then, everything was new and exciting. Did you get much support from friends and family? I can imagine some people might have been sceptical and unsure what this is all about? TIM: Yes, my Mum and my Dad were very supportive as you can see from the above – in fact on the launch of the Spectrum my Dad said “OK I’ll put my money where your mouth is” (I had phoned him from the April or May 1982 ZX Microfair in London where it was launched) and he began funding the commercialisation of my hours of programming late into the night by buying one for me, eventually raising a mortgage on the house to invest in the business – I was of course still in school (and College at the same time as they offered Computing) doing my A Levels. My friends were also very supportive and in fact if you look at the many early releases it is some of their work that is included either in the art works or in helping to assemble the product or just being foils for the testing of the software. My school however, felt I could do better on the quality of work and attendance (sometimes late after an all night coding session) although I was happy to work towards a B and 2C’s that Bradford wanted for a Robotics degree they wanted me to get A’s and try for a top end university – on reflection I should have seen that was praise for what they thought I could achieve not a criticism. Instead I was supported again by my Mum and Dad after an enforced morning trip to school (after a heavy night of programming) to see the head of 6th form that resulted in me coming home and announcing that I was leaving, 6 months before my exams! As the business grew more and more of my family and friends became involved to help out such as my Aunt Pam (same name as my Mum but her sister in law) who did a lot of packing and secretarial work. My Uncle and Cousin (Neil and Barrie) who were accountants etc. STEFAN: What were the first Gilsoft releases and how did you market them? 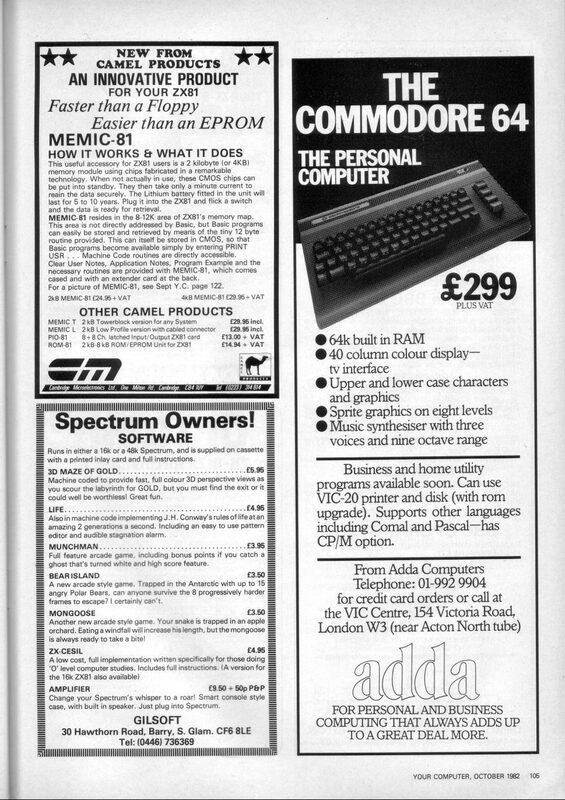 TIM: My Dad records “There was a long delay between our payment with Order to Sinclair after that Microfair” (one of the first uses for my Dad’s new credit card I think) “ and delivery of our ZX Spectrum in July but, by late August five programs were written and advertised in the August Issue of Popular Computing Weekly and the October issue of Your Computer (which came out in September) . 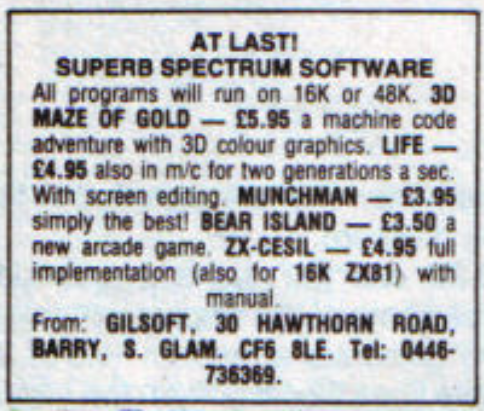 These were: 3D Maze of Gold, Munchman, Bear Island, Life and ZX-CESIL.” (Note from Stefan: Life is “missing in action” on World of Spectrum, Tim is already aware and will take care of that!). 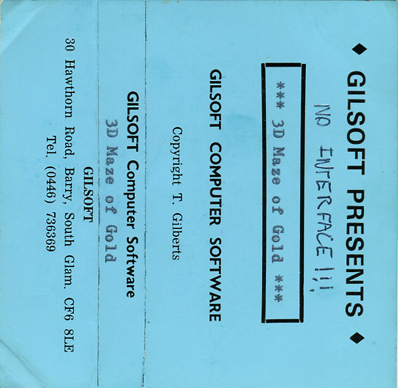 Early Gilsoft ad in YourComputer (1982). My Dad further records “The first public airing was at a small microfair in Bristol, this along with a small quantity of mail order sales was a slow start. To try to boost sales a stand was taken at a subsequent Microfair in London” this was probably the 7th on June 4th 1983 – we were on stand E2 with Bytewell a local games shop from Barry on E3 – for whom I had written an arcade game Hidden City in the interim. He goes on: The Spectrum was by this time housed in a DK Tronics keyboard which allowed the public to test drive the games more easily. The key board attracted far more interest than the software and people wanted to buy keyboards. DK Tronics had a stand across the hall from us (D1-12!!!) and as they had large stocks of keyboards with them we bought these in lots of ten at trade price on invoice and sold them at RRP. Before you ask: I am not sure that Munchman ever sold any copies as we had a legal letter from Atari pretty quick – I think that and a previous dressing down in my school years about copyright on cartoons in a small circulation student newsletter I ran, finally hammered home the Copyright lesson. Dad does not mention it in his notes from the time but, I am sure we were selling his home built amplifiers by that first Microfair as well, that plugged into the Mic socket so you could hear the music (well sounds) on the ZX81 and Spectrum. 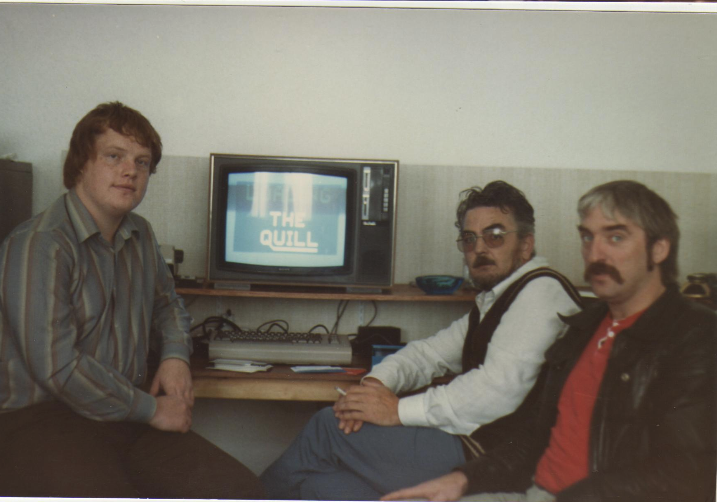 Tim presents “The Quill” on the ZX Microfair in 1983. 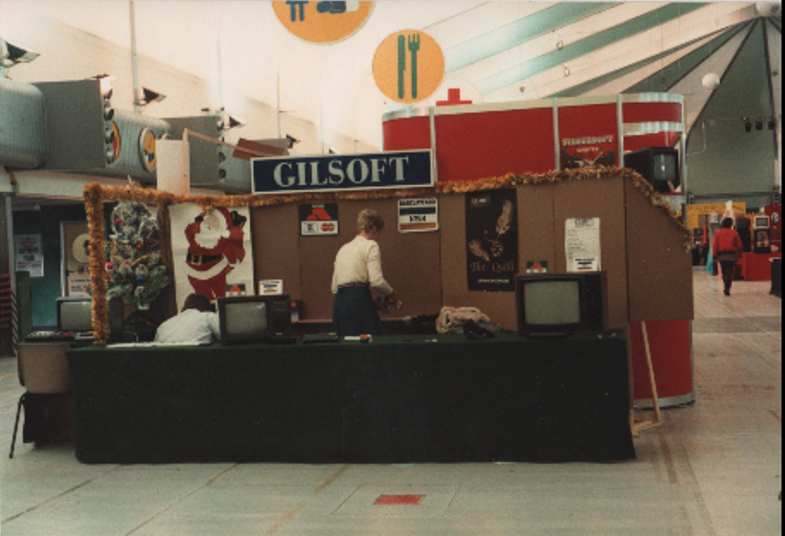 The Gilsoft stand that Howard Gilberts built. 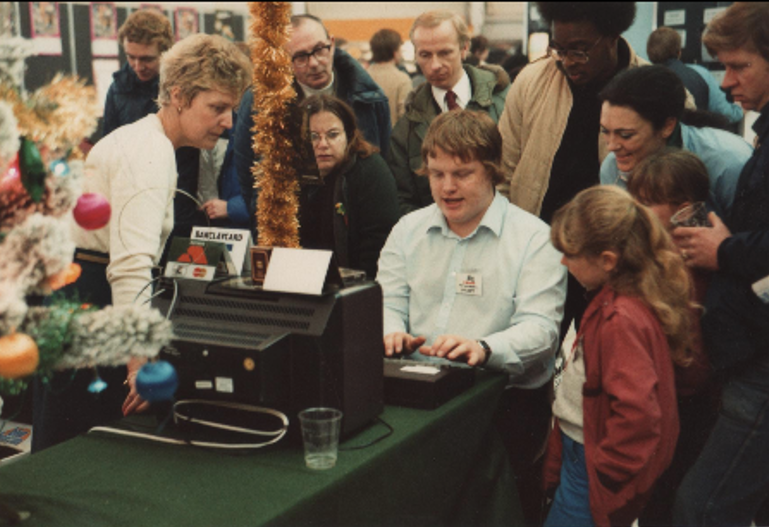 In these photographs from the Christmas 9th ZX Microfair (The public launch of The Quill) the TV on the left is running a Spectrum with a Microdrive and a Currah uSpeech showing our software demo – I’m sure it used to say “Roll Up Roll Up”. The first one is my mother looking on as I demonstrate Quill (you have already seen this on Twitter). Note the stand was built by, you guessed it – my Dad to save paying a professional firm. Our entry in the show guide below. STEFAN: How did you and Graeme Yeandle get together? As far as I know he already had an early version of what would become “The Quill” in his pocket but he approached you for publishing an adventure he had written with it? TIM: He came to see us with a view to buying some software – I always remember thinking when I saw him walking down the drive of our suburban semi (as my bedroom was to the front) that it was Clive Sinclair coming to call. 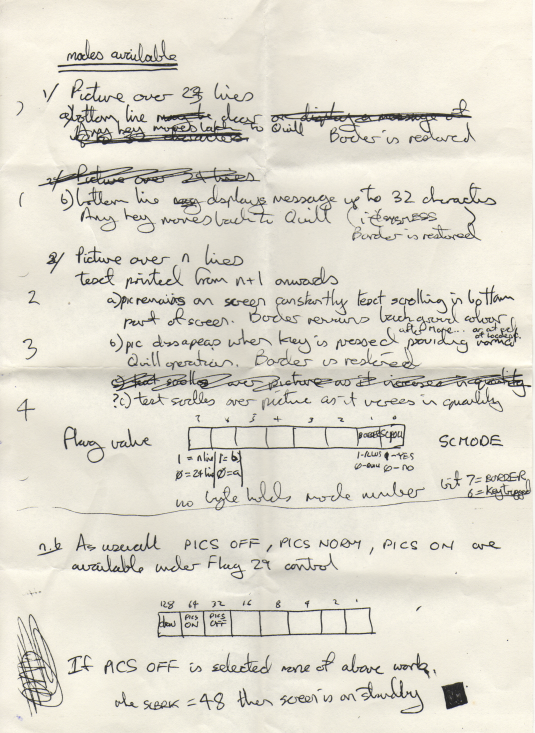 I wrote “Tasks” for example (Not a Quilled game) and “Timeline” was from Graeme on the Double Cassette, the adventure he had written using an assembler. Also Infinite Imaginations was just me as a developer initially as I started contracting not only to Gilsoft but, to Bytewell, St Brides, CRL, Activision etc. in an arrangement put together by our accountants. As you may know we set up the limited company (Gilsoft International Ltd) by April 1985 as the business grew, because Dad was running a risk as a sole trader. We even had a company in Guernsey at one time for the international work. Graeme and I also became friends. We played in a D&D / Gaming group on one Sunday a month – the Dungeon Master used a TI/99 to help with the game admin and we always had a great time. His family originally had a butchers shop, which in a stroke of coincidence was literally at the end of the lane running from the house at 2 Park Crescent. 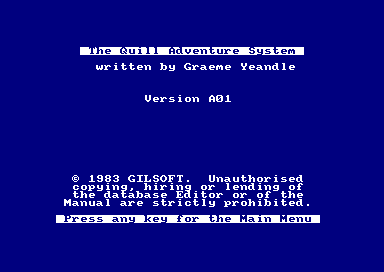 STEFAN: “The Quill” was distributed as an adventure development system, allowing even people without prior programming skills to create machine code games. It approached a broad audience, from hobbyist adventure writers to professional game developers. Whose idea was selling it as a standalone utility? Diamond Trail by Tim Gilberts. So I think on reflection I persuaded him to produce a tool that anyone could use, he came up with the Editor idea – I remember he didn’t think there would be much of a market for such a thing 🙂 perhaps a few hundred copies but, he produced a brilliant, easy to use tool which was tested to destruction – it didn’t have many bugs as he was a very meticulous coder. STEFAN: When you first saw “The Quill”, did you know immediately it would become that successful? The Quill came with beautiful designed box. STEFAN: The first version of “The Quill” was created for the ZX Spectrum, a computer widely regarded as spawning the UK home computing scene in the early 80s. I assume plans for porting “The Quill” to other platforms originated very quickly, following the great success. Did you have a priority list and can you tell me in what order the ports occured? I’m also very interested in who was responsible for the ports. They all seem to be very well done. TIM: Now you are asking – I spent hours searching archives to work this out: The Commodore 64 was next and Graeme wrote the 6502 code. I used that code to create the Oric 1 and Atmos versions. I think Graeme stuck then with the Z80 machines and produced the one for the Amstrad CPC and then the compiler based PCW one – he also converted my Spectrum Illustrator code for the CPC. Both of us had switched to using a BBC with a co-processor for our cross assembly work on CPM for both 6502 and Z80 by then. Unusually enough the BBC/Electron version was not based on the existing code base or work of the programmers but, on a separately developed program submitted to us by Neil Fleming-Smith. 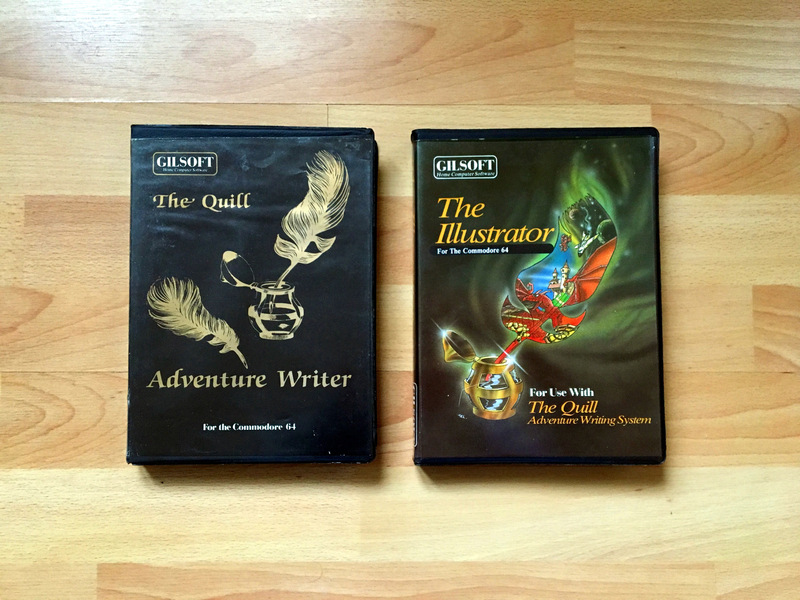 The Quill, Amstrad CPC version. I also had a bash at the Amiga and the Atari ST but, I think by then the contract work was becoming more prevalent and it really became a work machine for the graphics development on other platforms although the code for Mindfighter was developed for those two machines as well. STEFAN: The Wikipedia page says there was no Dragon32 version of “The Quill”, which is something I nearly couldn’t believe. I know Gilsoft was based in Wales and the Dragon32 was the only Welsh microcomputer. Can you tell me something about this? The Welsh Dragon32. The picture is a photograph taken from my original box. 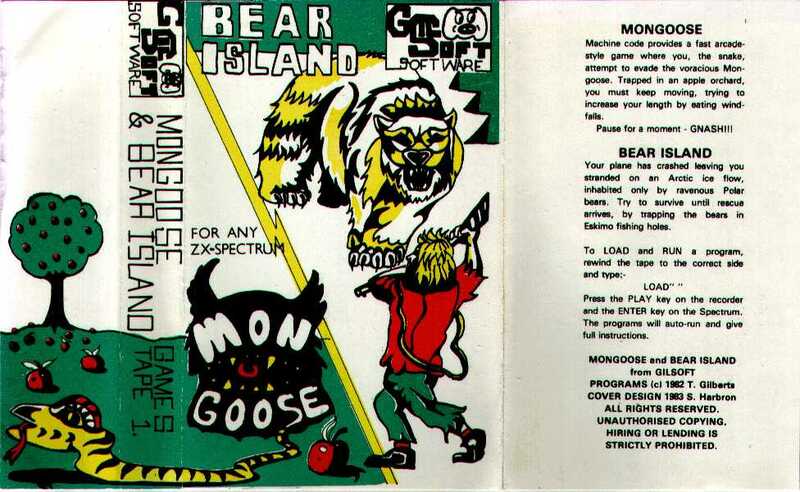 Actually the best would be to translate a copy of “pi” (if I can find the source code) this was the CBM PAW interpreter I custom wrote to allow games written on the Spectrum PAW to be run on the C64 and use CBM Illustrator to redraw and improve the graphics. This was what I used when commissioned by the likes of St Brides and CRL to help produce their games cross platform – I just charged for programmer time. News of this sort of work spread in the industry which lead to SWAN being commissioned by Abstract Concepts/Activision. 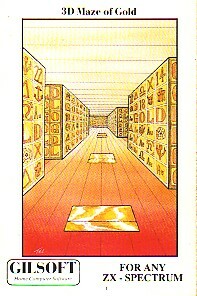 STEFAN: “The Quill” is widely regarded as the reason why there are so many text adventures written for the ZX Spectrum. In addition, it is considered as the first tool of its kind, inspiring quite a few adventure development programs. Reviews very favorable by magazines and readers. The Crash readers award from 1984 is a great example. Countless commercial titles were written with it. Gilsoft undoubtably wrote computer history. How does this make you feel today? TIM: Very proud of course – the experience was very exciting and fulfilling for me at the time, my friends went off to university or started working but, I was already earning, driving and eventually living in a flat on my own endeavours. There have been times when I have felt very fulfilled by my work, creative output or just life; working in Spain with Aventuras AD, Getting married, having a son and doing my Masters degree were amazing but, that period was special and exciting. PAW won the same award in 1987 – I still have that certificate on my Study wall. 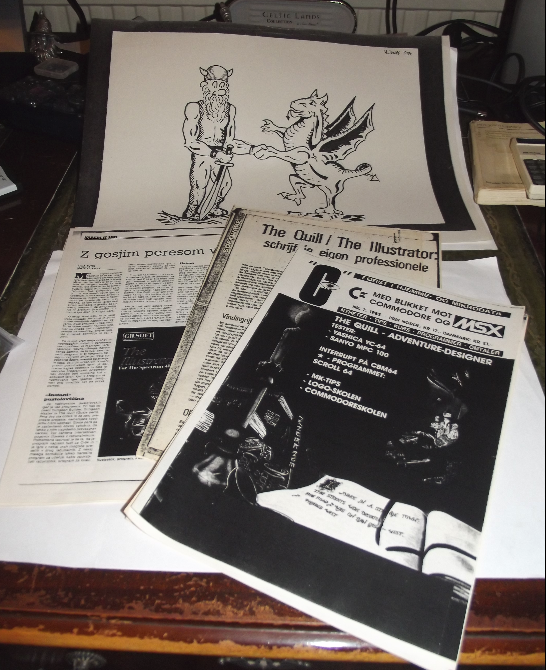 STEFAN: Gilsoft published “The Illustrator” in 1985, another groundbreaking release that allowed text adventure writers to add graphics to their creations. Who had the idea for “The Illustrator” or was it something that naturally happened based on feedback? Text adventures were turning more and more to graphic text adventures. TIM: I think it was just a natural progression and an obvious add on, I am not totally convinced but I think that by then we had been asked by some software houses to help them add graphics which also would have contributed to the idea. I think games like The Hobbit had shown that graphical adventure games sold in large quantities. Graeme as a purist was not a big fan of pictures or indeed of the complex parsing we added to PAW later. Obviously again people liked it; we were nominated for the 1985 British Micro Computing Awards (run by PCW, Sunday Times and Thames Television) for “The ‘database’ home software of the year award”, Quill was also up for the “The home software award” as it had been in 1984. We were a runner up at that year unfortunately but, had a great company outing to London sharing a table with Psion (before we were aware of their wordprocessor for the QL). 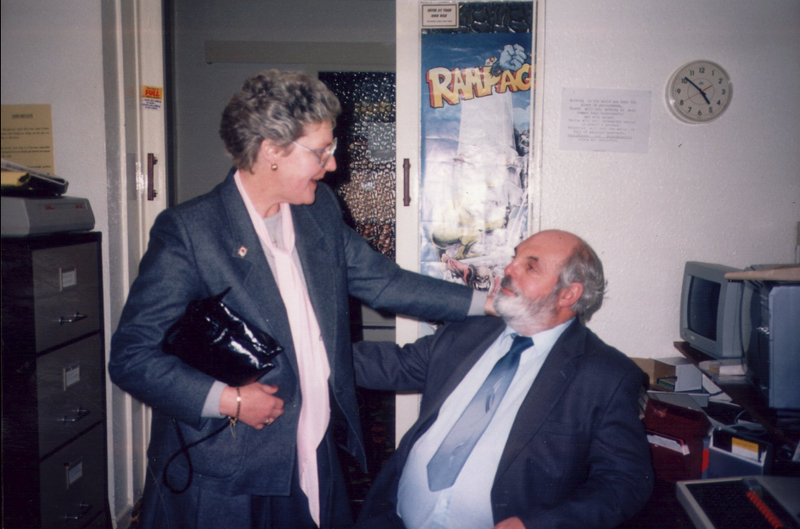 An extra member of our contingent of four was the retired Dr Peter Jones a family friend who occasionally tested the software for us and was addicted to the game Valhalla. He was in any case erudite, well dressed and good fun to have on a trip like that – when asked by someone from Psion what he did for the company, quick as a flash and with a straight face he indicated that he washed the Rolls Royce. He was also heard to comment to the CEO of a company that had produced a game with a bug in that annoyed him “he was working for the inland revenue on a special investigation into the profits of software companies” that got a splutter. That comment may have backfired as a few years later we had a visit from the VAT office who determined that VAT was payable on the books sold with software – they left with a very large Cheque and my Uncle and Cousin the accountants really annoyed at this apparent volte face in tax guidance. STEFAN: “The Illustrator” was entirely written by you. Can you tell us a bit more about the development process and what makes it so special? As far as I know it doesn’t actually store image data but rather information about how a picture needs to be drawn, making it very memory efficient? TIM: I am so sorry this is lost in the mists of time I really can’t remember much. You are correct that it is based on the idea of storing the sequence used to draw the picture rather than the finished item. These graphics were done with Illustrator. I know that the fill code (initially) or the rubber band line were based on an algorithm book I had. 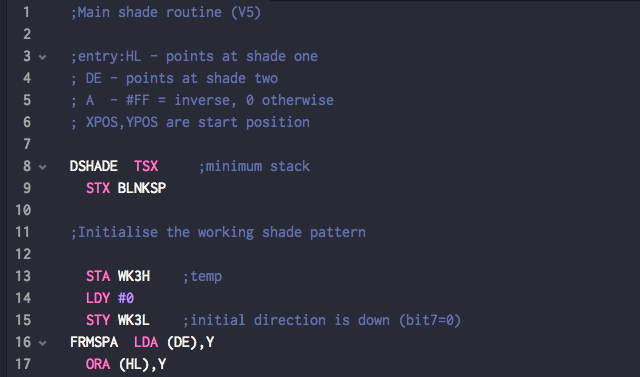 The shade routine that was eventually used came from a one off paid for piece of code from Ziga Turk. He should have been credited in the manual but, I think we misunderstood his request not to have his country (behind the iron curtain) mentioned – I cannot for the life of me remember how we met him but, it created a really cool effect. I think the idea really came from chatting with some of my friends who were budding artists and the way they constructed an image, it just seemed to have so few steps – half a dozen lines often created a picture and yet a screen took hundreds of bytes. It must also have been influenced by the Quill itself which allowed data to be inserted and edited – why couldn’t you do that with a drawing to perfectly replay and edit. The objects you could include in other pictures were just a logical extension of the use of subroutines in coding to provide the same thing in several places. STEFAN: You were also responsible for porting “The Illustrator” to other platforms? Handwritten design notes, “The Illustrator” by Tim Gilberts. STEFAN: In the US, “The Quill” and “The Illustrator” were sold under a different name and by a different company. Can you tell me something about it? Were the versions technically the same but rebranded and do you know if it was as successful in the USA as it was in Europe? We also had a Timex machine for a while to test the Spectrum Version – it did not work according to a standard technical support letter (unless you plugged in a Spectrum ROM) that I found in our archives. I have only just realised now (in 2016) but, I must have known then as I have the disks in the samples, that there was an Apple II and Atari version – they must have done that conversion based on our 6502 CBM code so I assume we supplied the source code under licence – they may have modified it, I may even have done some work on the Atari 800 code as we had one according to the Gilsoft Hardware Inventory of 1985. Just googling around they also produced ready to run games I didn’t know about. STEFAN: Were there other projects with the American company? Tim Gilberts discussing the Nordic deal. The Nordic version was quite successful. STEFAN: What I really love about Gilsoft is “The Gold Collection” series. You published software that was written with “Quill/Illustrator”. How did this happen? Did you ask people to send their games for a quality check and you decided what is worth publishing? Africa Gardens is quite a good example. This is great marketing in my humble opinion. You encourage people to write games with your tools so you can distribute them. TIM: Actually we did receive a lot of offers for games for possible publishing; the Quill manual included a boxed text: “We would be pleased to look at adventures you have written with a view to marketing them.”. We turned away a lot but, we did start marketing some of them after a thorough evaluation – I will try and find a copy of the formal evaluation sheet we gave our testers. 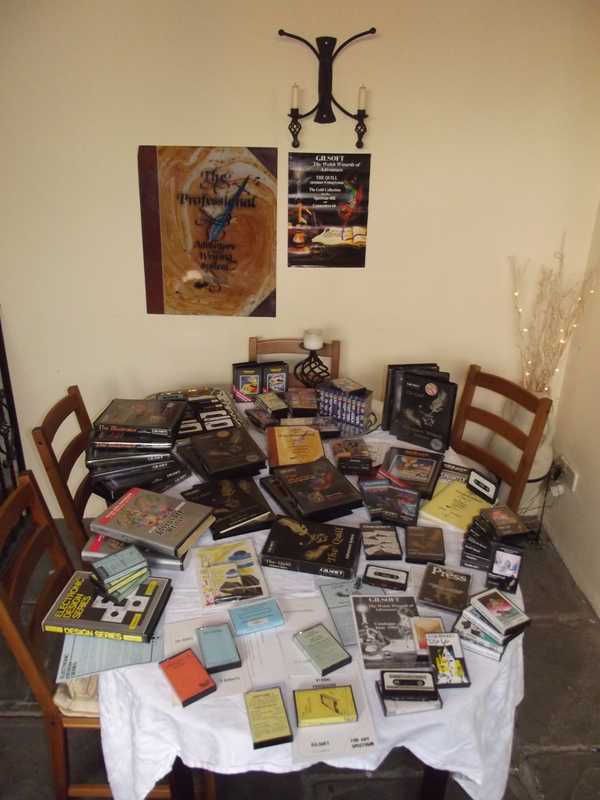 It must have seemed a logical step for us and we tried to put a real range of games together – taking some of the ones we had earlier sold and some new into a single style – the Gold Collection – they rapidly dropped to a budget price as well, although some Authors pulled out at that point. I notice Spyplane sells on ebay for nearly ten times its budget cost when new or just under four times at its launch price. I am not sure why the Hollow and Madcap Manor were only sold as a separate products but, it is probably due to the graphics work and their scale, they had bigger boxes as well. 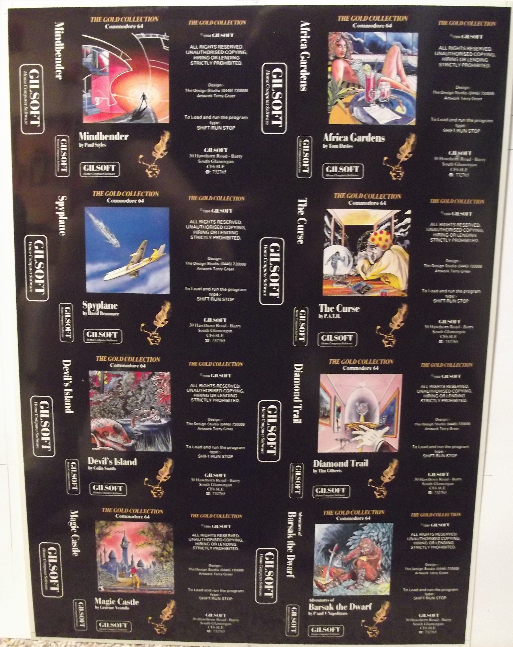 As a C64 and Gold Collection fan you should like this photo of a production plate. STEFAN: After “The Quill” and “The Illustrator” it was time for a successor with new features and a very advanced parser. “Paw” is a more than worthy follow-up with very favorable reviews. How did the development of “PAW” happen? 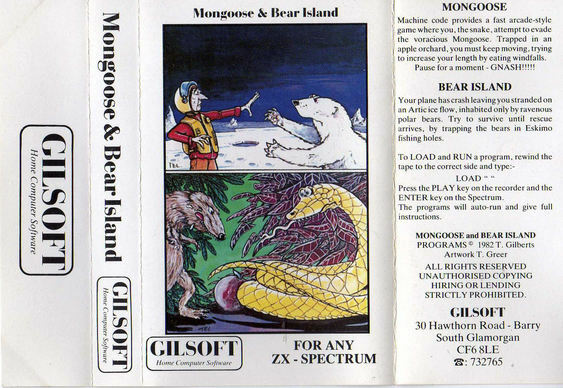 It is considered as THE tool for rapidly developing adventure games, at least on the ZX Spectrum. I think “PAW” actually is not that far away from “Quill/Illustrator”? TIM: I think you are correct the PAW just developed as we had so many separate tools like Quill, Illustrator, Patch, Press, Characters, Microdrive support, it just seemed logical to combine them into a single tool – and of course take the opportunity to really improve the parser to allow more natural interaction with the machines. The integration also allowed us to more tightly integrate the graphics and support the 128K memory of the later machines. 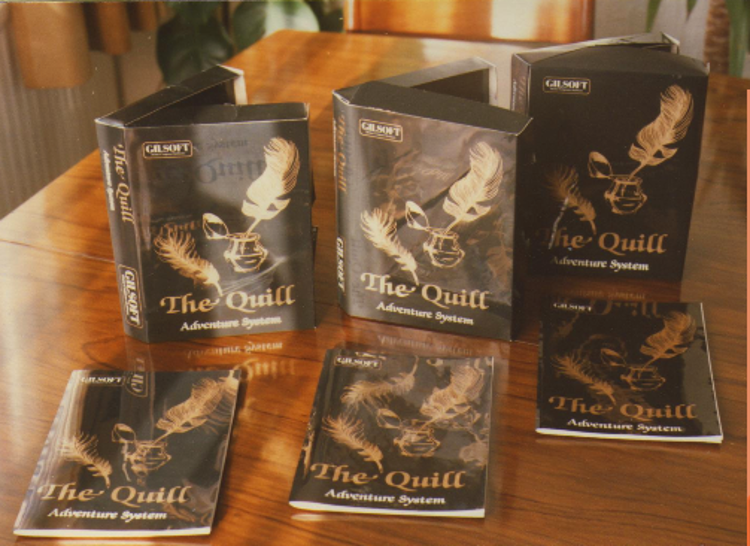 STEFAN: “The Quill” was available for countless platforms: ZX Spectrum, Commodore 64, Amstrad CPC, BBC Micro, Acorn Electron, Atari 8-bit family, Apple II, Oric. “Professional Adventure Writer (PAW)” was exclusively released on ZX Spectrum and CP/M. Why was that? I could imagine that at least an additional C64 version made sense in terms of commercial success. TIM: As I alluded to above we would have based the development on the number sold for a particular machine – I suspect that as the C64 was more popular in the US, the Codewriter deal had reduced our direct sales. Then again we may have just not got around to it before the world began to shift to click interaction graphical adventures. STEFAN: How did Gilsoft continue after the release of “PAW” and do you remember what was the last Gilsoft release? TIM: Dad continued to sell the remaining software stock for quite sometime afterwards into the 1990’s even after he set up his new Home Brew business. I do not think we released much further software after PTM (Phosis/Tel and Mega) in 1987 http://www.mocagh.org/loadpage.php?getgame=pawptm and QL Notebook in 1988 (reviewed in Sinclair/QL World Nov 1988) written by a close friend of mine at the time Ian Davies. The Forge never became reality. 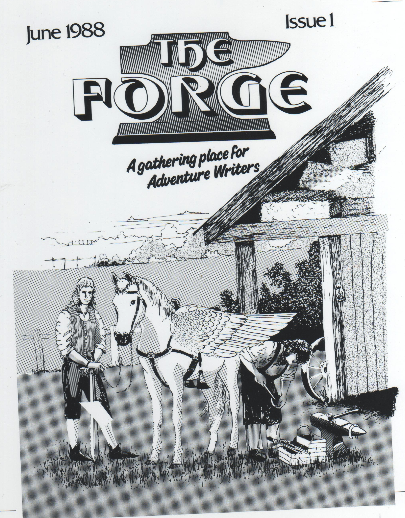 I also remember us looking into setting up a magazine “The Forge” not sure how far it got as I think it was around the time I started working with Aventuras AD in Spain. I do remember sitting around on my return from Spain (the early days of online systems like Prestel and BBS) and then even later again during 1992/3 when I started running Linux 0.98pl8 on my 286 of discussing with my Dad doing a multiplayer gaming system. STEFAN: When did you decide to end Gilsoft and how did it happen? HOPos (DOS) by Tim Gilberts. TIM: I think it just fizzled out while I was working in Spain probably to the regret of my Dad (but, he was ramping up the HomeBrew business another hobby turned sideline and then into a business) but, the market was also changing to large graphics and arcade based game production groups and of course I had been working as part of one of them with the Aventuras AD team helping produce what I think were some very high quality products. But, that is another story. STEFAN: Present-day, people still use “The Quill”, “The Illustrator” and “PAW” to create adventure games for classic 8-bit machines, you also know I am using “The Quill” currently to develop a text adventure for the C64. The retro scene is so vibrant these days. How does this make you feel? I suppose the memories of the work will outlive those involved, so it is my 15 minutes of fame and also for my Mum and Dad (my Dad sadly passed away in 2014) seen here in a shot from the office; probably around 1986, after the store and computer room flooded and we had to relocate the development BBC to one of the smaller offices. STEFAN: Are you still in contact with Graeme Yeandle? TIM: I had not spoken to him the last few years but, we have had occasional contact by e-mail including recently. I am also in occasional contact with Phil Wade who wrote the Patch and Press – the split screen function and text compression add-ons to Quill that was also built into PAW. Since you asked these questions I have also been put back in contact with Huw Hamer Powell while researching the preservation of the QL version of Quill Adventure Writer with Rich Mellor from RWAP software. STEFAN: How much are you into retro computing? 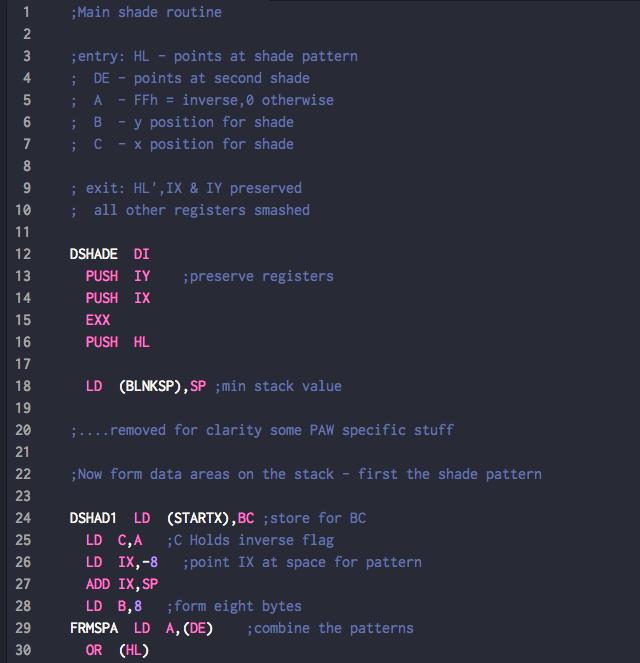 TIM: I have dipped into the retro scene over the years running various ZX81 / ZX Spectrum emulators and discovering I did not need to preserve even the rarer pieces of my software like CESIL. I was also presented with a ZX Spectrum Re-created the year before last to join my Raspberry Pi projects. Recently you have sparked an interest again and the first step has been to find what equipment I still have, fix what is not working and try and preserve some of the things that will otherwise be lost like source code and historic records as they become unreadable or damaged in damp hot attics – like most of the 40 odd Microdrive cartridges I have – new felt pads and some new capacitors got them and the microdrives working again. The main purpose of this effort is to fill in the preservation gaps – for example I noted that ‘Life’ (as in the first advert) is marked as missing in action on the WOS archive so I was very pleased the other day when I got my Spectrum, Disciple and 5 ¼ drive working and there was a copy saved on the system disk… next I need to work out how to get it onto the PC and then as a TGZ before it all fails again. I will always have a soft spot for the C64 (mainly as the 1541 drive had its own 6502 processor which was really cool) and you could do some very interesting things with its architecture. I also think it is the only machine I have ever worked on where I had to use an oscilloscope to debug software as we discovered a timing error in some versions of the machine that affected our software. 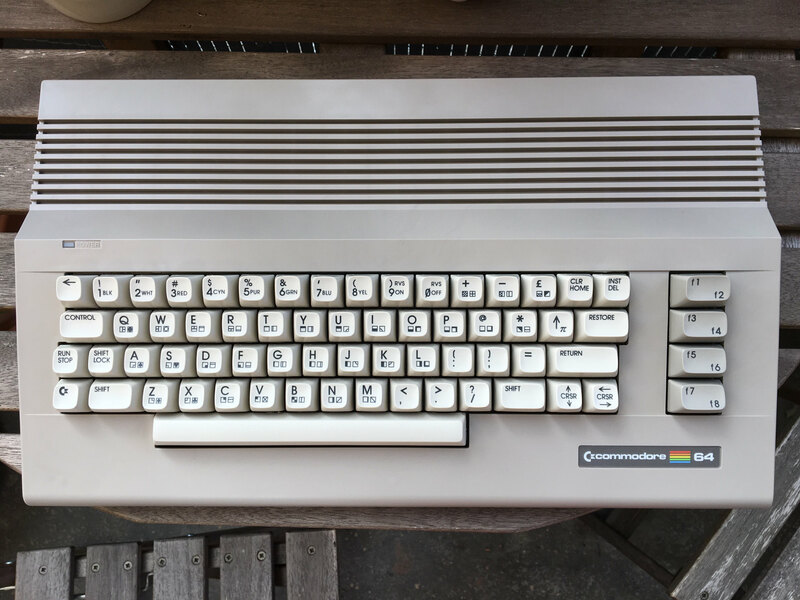 I wasn’t sure where my C64 ‘s went until I found the company on-loan records but, ebay has provided some very broken ones I am nursing back to life slowly – the only original part is a VIC-II graphics chip with the timing error (found in my electronics junk box) to get a breadbox working. I have also managed to get an ebay purchased Dragon 32 running to recover the copy of CESIL for that – I could have done it with XROAR but well its more fun with the physical machine. 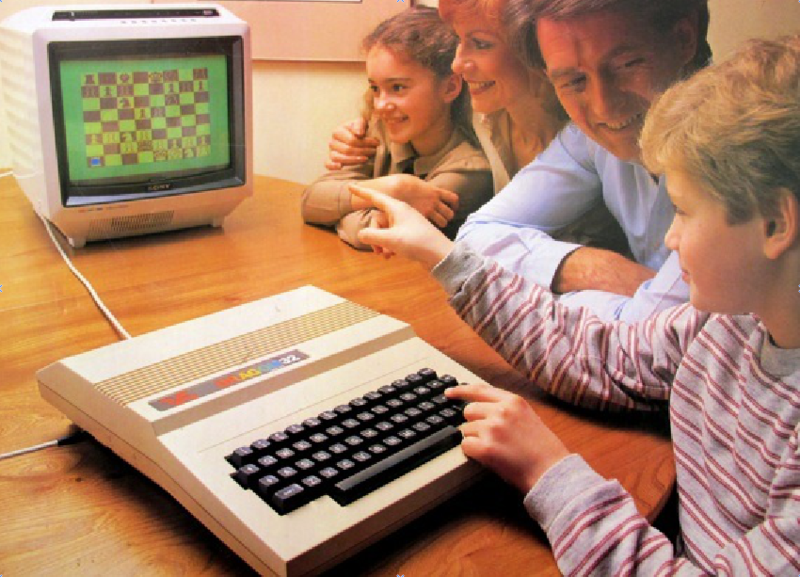 STEFAN: If you were forced to pick one 8-bit computer back from the golden era, which one would it be? I think I already know the answer but I am very curious. TIM: The ZX81 as I really had to learn assembly code by poking numbers into memory. I recall struggling to work out the exact position for reverse jumps so I put in some NOP codes before the targets and over estimated. I loved it so much it was screwed to a wooden board and it went on Holiday with us to France running from the 12v Caravan battery with an old 12v black and white TV. My copy of “Programming the Z80” is falling to pieces but, that degradation started over 34 years ago as it was so well thumbed then. Coda: I hope you enjoyed our trip back to the early days of home computing. I don’t think there is a need of adding much to Tim’s words at this point. He was so kind and I really enjoyed working with him on this. You might want to follow Tim Gilberts (@timbucus) on Twitter. This article is dedicated to Howard Gilberts.